The population of a town is 3,11,250. The ratio of women to men is 43:40. If there are 24% literate among women and 10% illiterate among men. Find the total number of literate persons in the town? Diameter of a wheel is 3 meter. The wheel revolves 28 times in a minute. To cover 5.280 Km distance, the wheel will take how much time? A man and a boy can complete a work together in 24 days. If for the last six days boy alone does the work then it is completed in 28 days. How long the man will take to complete the work alone? 1M + 1B complete the work in 24 days. Last 6 days boy alone does work. They worked together for 22 days (Because the whole work complete in 28 days). Rest work done by Boy in 6 days. A man covers 9/20 by bus and the remaining 10 Km on foot. Find his total journey (in Km)? A bag contains 75 balls out of which at least 15 balls are red. If three balls are picked at random from the bag, what is the probability that one of the balls is not red? I. Only 35 balls in the bag are blue. II. When a ball is picked at random from the bag, the probability of the ball being white is 1/5. III. When two balls are picked at random from the bag, the probability of both the ball being green is 12/925. Any one statement is sufficient to answer the question. Any two statements together are sufficient to answer the question. Statement I and III together are sufficient to answer the question. All three statements together are sufficient to answer the question. All three statements together are not sufficient to answer the question. Answer – 5) All three statements together are not sufficient to answer the question. Using I and III or II and III or all I, II and III together we cannot determine the exact number of red balls in the bag. How many male students are studying Sociology and commerce together? 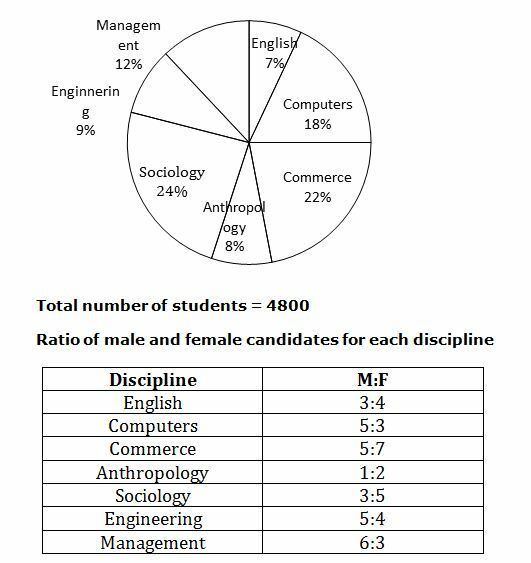 What is the ratio between the number of female students Management and Computer respectively? What is the total number of female students studying Commerce, English and Engineering together ? What is the difference between the male students studying Sociology and Female students studying Anthropology ?